The wealth of artifacts discovered at the Confederate prison of Camp Lawton this summer are going on display starting tomorrow at the Georgia Southern University Museum. The exhibit will run until May 1st of next year. Archaeologists weren’t expecting to find much more than evidence of the temporary structure — postholes from the stockade, for instance — but because the prison was evacuated in a rush on the run from Sherman’s troops, prisoners had to leave many of their belongings behind. After the war, the location was neglected and forgotten, then it was a protected government hatchery, so unlike every other stockaded Civil War prison, Camp Lawton was never picked clean by sight-seers and hobbyist. Some of the artifacts on display include a name inscribed clay pipe, an actual rifle used by one of the Confederate guards — as well as a picture of the guard — a large collection of coins and buttons and other mementos. 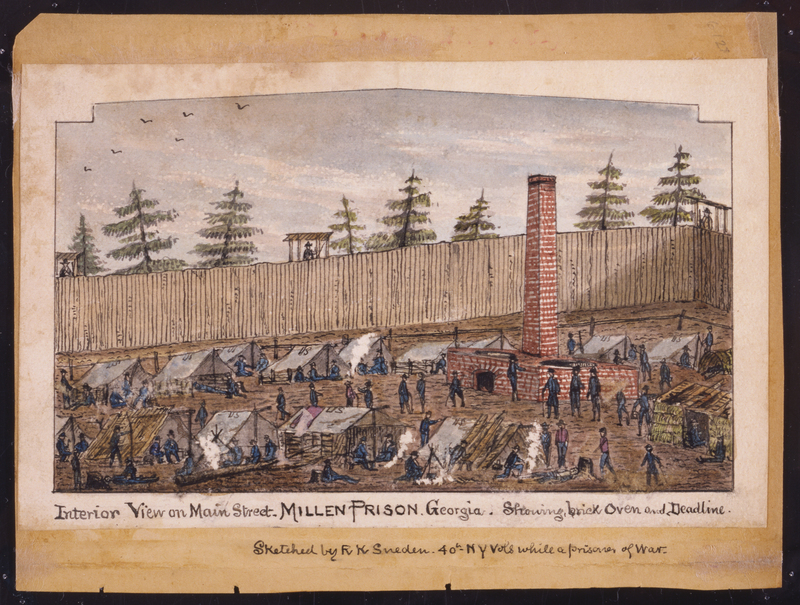 The exhibit will also feature the illustrations of Robert Sneden, a Union prisoner interned at Camp Lawton. Sneden was an experienced mapmaker and drew sketches of everyday Camp Lawton life, which he kept hidden from Confederate wardens by sewing the drawings into the lining of his coat. Sneden was a Union private originally from Nova Scotia. He had worked as an apprecentice architect in New York, so when he volunteered for the 40th New York Volunteer Infantry Regiment in 1861, they soon put him to work drafting campaign maps. He was witness to and depicted some of the most famous engagements of the war, like the Second Battle of Bull Run/Manassas, Antietam, the siege of Yorktown. He was captured in November 1863 at Brandy Station, Va., then moved to Georgia where he was kept prisoner at the notorious Andersonville prison. When Camp Lawton was built to alleviate the severe overpopulation at Andersonville, Sneden was one of the prisoners transferred. He sketched assiduously at Camp Lawton, taking advantage of the greater freedom allowed him outside of the stockade as a prison parolee. Legend has it he sewed the drawings into the lining of his clothes to keep them safe from his captors. When he was finally exchanged after 13 months of internment, he returned to New York, wrote a memoir, and made watercolors from his sketches at the front and in prison camps. He died in obscurity, his work unknown, in 1918, until it was found in 1993 in a bank vault in Connecticut, then sold to the Virginia Historical Society. His watercolors and drawings are the largest collection of Civil War art by a single artist known to exist. Sneden’s diary was published in 2000 as Eye of the Storm, and the full collection of over 300 images was published as Images from the Storm the next year.